Yvette Perri is a residential architecture designer and jeweler. "Designing jewelry is a passion! I love finding new ways to work with the beautiful gemstones and precious metals." Yvette lives in Virginia with her husband and Jack Russell Terrier. Pieces in our collection are carefully handcrafted and created with precious and semi precious gemstones, fresh water pearls, shells and Swarovski crystals. All are set in sterling silver, 14k gold filled or solid gold findings. "Jewelry has always been here to embellish and complement. So my pieces are designed to be extremely attractive and adorning (def. to endow with beauty and elegance)." 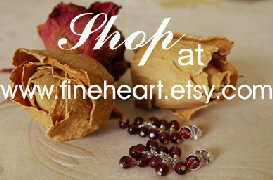 Fine Heart jewelry pieces are limited edition or one of a kind. I specialize in Wedding Day and Bridal Party jewelry. My aim is to please my clients and give them a great experience buying my lovingly handmade jewelry. I have been commissioned by brides, wedding parties, spas in the Washington DC Metro Area and retail stores. This is my passion and I would love to work with you!